Funky retro style lamps and lamps shades were very modern in the sixties. Styles ranged from ultra modern to psychedelic. This is a guide to the original retro lighting. The Lava Lamp, left, was designed by Edward Craven Walker. They were first introduced to an unsympathetic British market as early as 1963. However, as psychedelia became all pervading their popularity rocketed. It was like having a psychedelic experience in your living room without touching LSD. Possession of a Lava Lamp was enough to badge you a member of the hippy movement. The Lava Lamp continued into the 70s. Its popularity only waned in the 80s. It hardly seemed the perfect accessory for the yuppie generation. The original Lava Lamps were made by Crestworth. The copper finish also seems to be unique to the original ones. Later versions are made by Mathmos. There is always a good selection of original 60s Lava Lamps on eBay. The 'Astro' model sells for £30 to £60. Look out for ones in good condition without dents. Expect to pay a bit more for the 'Rocket'. There are other ways to get the retro look in lighting than the Lava Lamp. 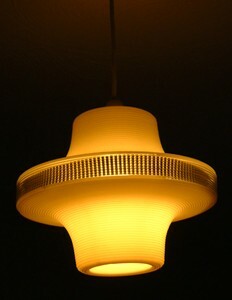 Rotaflex lampshades were made of a continuous strand of nylon. These lampshades were ultra moderns in line with the "contemporary" design aesthetics of the age. John and Sylvia Reid, consultant designers for Stag Furniture, also designed for Rotaflex. The lampshade on right is by Rotaflex. The ball lampshade on the left does not carry a maker's mark. Butlin's used a similar design to this one to give their holiday camps a modern image in the 60s. It may have been made by Rotaflex, or possibly by a competitor. 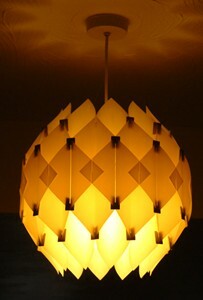 Inexpensive lampshades in modern designs were popular in the 60s. This lampshade, left, looked modern at the time. It still looks great in a retro style home today. This lampshade from the late sixties shows some of the ambiguities of the age. It has the look of a spaceship, combined with wooden decoration that has an African tribal feel about it. This selection of lighting from a 1966 Green Shield Stamp Catalogue shows that modern was not everyone's taste in the 60s. There is a beautiful spun copper circular shade at the top of the picture and a classic retro style tri-pendant light with 3 globe shaped shades. However, a number of the lampshades and stands are quite traditional. There is even a Victorian style mock oil lamp (bottom right). Paradoxically this was quite trendy in the mid sixties.